A few years after the original Chuck Rock adventure, Chuck has been kidnapped. Now it's up to his son to grab a club and rescue his cave-dwelling daddy from certain doom at the hands of bad guy Gary Gritter. Gary Gritter...dear, dear me, it doesn't get much worse than that - or does it? Read on to find out if you'll be dumping this in a steaming heap of dino dung or if you'll be chuck-ling (sorry) along with the decidedly lowbrow antics of the ugly spawn of Chuck's bristly, stinking, loins. 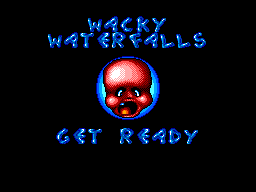 As the son of a stinking cave man, who obviously wants to follow in the footstamps of his flea-infested father, you'll be submerged once more into a world of brightly coloured platforms with nothing but a club and your wits to help you traverse the gaps and batter the enemies that dwell between them. Luckily collision detection is fairly good, and the level design is filled with enough panache and secrets to keep you pushing forwards into the undergrowth. One minute you'll be running across stone age power lines (don't ask) filled with birds and delicious sweeties, then the next you'll be belting rocks onto spikes to provide a platform over the arse-pucturing badness below, then you're jumping over puddles of sludge in some rudimentary stone age sewage system. Fair enough, it's nothing terribly new, bottles of milk take the place of apples or meat or first aid boxes in providing health, and enemies follow their simple paths, but for those who dig the subject matter the whole aesthetic and atmosphere is going to be irresistible considering it all works so nicely. 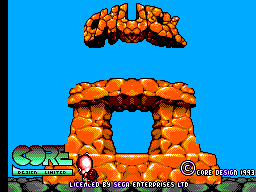 The first thing that'll hit anyone playing Chuck Rock 2 will be the fact that the graphics are stunning. 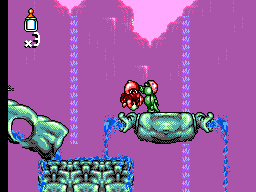 Detailed platforms and really well animated enemies will provide a few smiles to even the most hardened Master System owner. Tiny details such a eyes peering from holes in the earth below to birds resting on power lines, and even the numerous guises the enemies come in - some are dressed as dinosaurs while others are wearing living furry creatures on their noggins as wigs that attack you when you attack their owners! For anyone who has played the Megadrive/Genesis version you'll find the graphics downscaled but still very recognisable and most of the essentials remain intact. A fine effort on behalf of core and miles better than the backgroundless vacums of the orginal Chuck Rocks world. On a side note: I'm not sure if Son of Chuck was supposed to be cute but he is toxic avenger ugly, not the most endearing of characters - not by a long shot. Funky jungle sounds and cheery platform typicalities are abundant throughout but there's nothing truly offensive in here. The sound effects are nice and chunky too and the sound of mini-Chuck's club connecting with the skull meat of an enemy cave dweller sounds nice and crunch and satisfying. There are a few ambient affects to be had but nothing outstanding. All in all it's a great effort and it comes together like a juicy tune bomb that'll have you tapping your feet along with your thumbs. Sharp, sharp controls. Beautifully simplistic and responsive and provide you with enough scope to make pixel perfect jumps and smack enemies senseless. Trust me if anything goes wrong in this department it's more likely to be your fault than the games. One play through and you could go for harder difficulty settings but you'll probably have seen all that's on offer and there are better, more inventive, platformers on the system in abundance so whether you come back to it is all down to personal preference I suppose, but I completed it then bunged it to the back of my collection not to be seen for a good, good while. Overall it's not a bad game at all, it all works well and it looks nice enough, but consider when it was made and it isn't terribly innovative. You can't help but feel that Core played it a little safe when compared with the original Chuck Rock�s mechanics that, at the time, seemed like a step in the right direction. However having said all this it kept me stuck to it till the end, and that is no mean feat when I�ve got hundred-and-odd other Master System games waiting for my attention. Not bad, just nothing fantastic.